I packed up in the morning and sat in the bar again for breakfast. I enjoyed listening to an old local man tell a couple men about War and Peace and other feats of literature. This was an interesting contrast to the young men talk of the front-end loaders they had driven the night before. I called ahead to Deadhorse Camp to reserve a room and add my name to the tour list; you can only get to the Arctic Ocean by passing through security on an official tour, and you need to give 24 hour advance notice to them for a background check. Then I walked over to the airport for a photo, fueled up at the general store, and headed out. 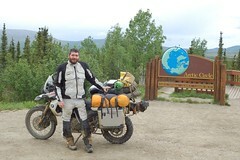 I retraced eighty amazing miles along the Elliott Highway to the start of the Dalton Highway. The haul road was built for hauling equipment and supplies to and from Prudhoe Bay. It is a road built for trucks, over four hundred miles long, with only three gas stops in the summer: Yukon River (Mile 56), Coldfoot (Mile 175) and at the end at Deadhorse (Mile 414). In between there isn’t much built by humans beside the constant companionship of the Trans-Alaska pipeline. Occasionally there is a small Alaska DOT station or a pump station for the pipeline, but there are no available services here. On occasion the haul road is paved, often full of dips and heaves, which don’t bother the bike much. The rest of the time it is various consistencies of dirt, gravel and mud, depending on weather and road construction. I had received lots of advice for riding this road, such as looking ahead for oncoming trucks to avoid meeting them on a corner, where they might kick up large stones at you while passing. I have a Class B Commercial Drivers License and I spent a couple years driving a truck in conjunction with a salvage job, so I probably carry a bit more sense of connection to truck drivers than most; consequently I intended to always yield to them and make the least impact on their day that I could. Many of the trucks equip large Lightforce lights, some as work lights on the back of the cab. I was traveling faster than most of the traffic, particularly the occasional RV, and a few trucks used these to signal back to me that it was clear to pass. At times the road was narrow and I would slow or stop to pull over to give the trucks plenty of room. While the road is physically large enough for two-way traffic, the sides of the road are often loose gravel. It is difficult to keep the bike upright in loose gravel, the deeper the gravel the more wobble I would get in it. I never dropped the bike, but it sure felt close a couple of times! 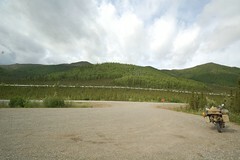 Note that the road is also built up on a few feet of gravel to keep the permafrost insulated from the roadway. Consequently, there is no shoulder to pull off onto. Occasionally there is a road siding for stopping, but you can’t stop in the road to take a picture; keep moving. Just before Coldfoot, I saw a roadsign that read “Arctic Circle.” I stopped and thought, “really? That’s it?” When I turned around I found the road lead to a parking lot with a better sign. While I was taking a photo of the sign, a couple of folks walked over who turned out to work for the BLM and gave me a certificate for reaching the Arctic Circle! I chatted with them for a bit before continuing on. The view is just stunning, miles and miles of endless mountains, rivers and forest. After Coldfoot, the road gets a bit worse. The gravel sections were not technical, but required constant concentration on the upcoming road consistency. A well packed dirt road could be traveled easily, but might transition to gravel with calcium chloride to reduce dust awfully quickly, and if you weren’t paying attention it would take you by surprise. Remember that with 414 miles of highway, and 240 miles between two gas stations, you can’t take this road too slowly if you intend to every make it to the other end. Between Coldfoot and Deadhorse lies the Brooks Mountain range. 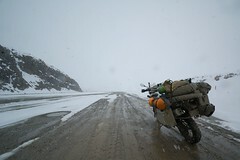 When I left Coldfoot, it was nice and sunny out, but when I reached Atigun Pass, it was 25 degrees out and snowing! I had been looking for a rest stop as it got colder, but finding none I finally stopped at the pass to put on another sweater and my glove liners. I would have liked to put on some long underwear, but I wasn’t about to take my boots and pants off in that weather so I stuck it out down the other side of the mountain. The Brooks Range captures most of the precipitation and to the north, across the continental divide, it is technically a desert on the slope. Soon there was little more than rolling hills of tundra, with the occasional Dall Sheep herd. I pressed on. An aside on fuel; the F800GS holds about four gallons of fuel and was getting about 45mpg. This varies a lot based on if I was running premium or regular gas, and how much time I spent on the highway at high speeds. I left a little concerned about finding premium gas, as the bike claims it requires it. Unfortunately the internet is full of arguments over why that then get distracted over how higher-grade fuels are produced, additives and what countries have a mix-grade from mixing regular and premium. For what it’s worth, I ran premium whenever it was available, and regular the rest of the time. You have no choice on the Dalton, north of Fox, Alaska and you only have a choice about half the time on the Alaskan Highway. I carried two gallons of spare fuel in a Rotopax container, which I only had to use for the 240 miles of country between Coldfoot and Deadhorse. As they say, your mileage may vary. If you’re adamant about running only premium out of fear of engine knocking, a $2000 Touratech 5 gallon add-on tank is still going to only get you a 400 mile range. I’ve read that your dealer can detune your engine for regular gasoline, that is probably the cheapest and safest route for any remote travel. Truck traffic is lower in the summer than the winter on the haul road, because most of the construction happens during the winter when the slope can safely be traveled with minimal impact to the ground. Consequently, I saw as many adventure motorcycles as I did trucks. The man from the BLM told me that a lot of people headed for Deadhorse only make it to Coldfoot, because they turn around. This was a surprise, but when I thought about it further it is a pretty unfriendly climate up there. Deadhorse camp is at the beginning of town. I found the right lot alright, but I couldn’t tell which building I was looking for. The lot was full of sleep trailers mounted on skis, clearly empty awaiting winter to come. I parked the bike in front of one building and literally fell off it from exhaustion. After standing the bike back up, I tried the door to the largest building, the same kind of door you use for a cold freezer, and found it to be the right choice. While expensive at $200/night, Deadhorse Camp provides everything you need; a private bunk room, shared showers, laundry, a lounge and a kitchen. They helped me bring my gear inside, as boots must be removed at the door, and I found I had made it in time for the end of the dinner buffet. There was some kind of wireless internet available, but it wasn’t free. I flipped through a couple TV channels, then caught up on my text messages enjoying the first cellphone service I had in days. I had to get some rest, as I had to get up at 6am in time for breakfast and an 8am tour. Awesome, just so cool. Keep it coming.